Don't keep original features hidden under carpet! your mosaic or parquet floor can be restored - by you or trade - without sanding! What is a nicer surprise than to remove the carpet from a room in your home and to discover a valuable original mosaic or parquet floor is hiding beneath it! Especially when you consider that installing a brand new parquet floor costs around £ 125.00 - £ 145.00 per sq m. And that’s just for a simple mosaic or herringbone pattern. Many older properties now reveal their original solid wooden floor underneath carpets and new owners who want to bring it back to its authentic grandeur (and value) often decide against restoration because of the daunting task of sanding. And so, many valuable original features in properties stay hidden for that one reason. What a pity, because very often this new discovery will only need some TLC to bringback its grand lustre it had originally. Is your floor covered in dirt, old stains and grime? Does your floor look like it has no finish coat at all, looking dull and lifeless? Is your floor missing tiles or blocks? With the increasing trend to "Don't move - Improve" in mind, we've created a brand new FREE guide to see if and how your original mosaic or parquet floor can be restored without sanding, specially for you. I thank you for your interest in our floor and must compliment you on the products that we ordered and used with great success. I am pleased to tell you that our herringbone parquet floors in the hall and diningroom have been successfully restored and look beautiful since we followed the cleaning, restoration and maintenance tips you sent us. They have also been admired by our neighbour and our son. Your e-mail address has been given to them and our recommendation. I hope that they contact you in due course. The weekend's over and I have finally cleaned and polished the new floor, and it looks beauuuuuuutiful! I was convinced I would have resand and oil but thanks to your guidance, looks like you were spot on when suggesting that all it needed was a bit of tlc. Im so happy with the ecowash and the polish, they've really made my floor look a hundred times better than it was originally. Thank you for helping me over the phone too (sorry for pesterinig you so much!) Your service is second to none, and I've already recommended the ecowash to colleagues at work. I'll be looking to spray it in a few months time with my ecospray thingie.. Simply pop in your details in the form below and the free guide will whiz its way to your inbox almost immediately. 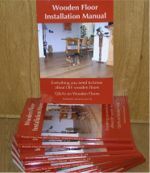 If your floor is missing some blocks, has damaged blocks – damages from plumbing comes to mind - see our guide "7 Easy Steps to Repair/Restore your Parquet Floor". But 9 times out of 10 some extra TLC is the only thing needed and to be honest, sanding down an authentic 'old-fashion' mosaic or parquet floor removes much of its appealing character.